In July 1940 the U.S. and Great Britain were the only democratic powers left in the world. In contrast, U.S. army nurses “enjoyed a casual resort-like atmosphere” in the tropical paradise and fascinating culture of the Philippines. 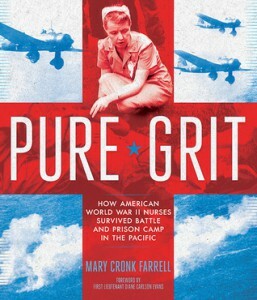 So begins “Pure Grit: How American World War II Nurses Survived Battle and Prison Camp in the Pacific” (Abrams 2014) by Mary Cronk Farrell. The Japanese bombed Manila and the American medical force escaped into the jungle. WWI surgical instruments preserved in Vaseline and wrapped in 1918 newspapers were found in a warehouse supplying the makeshift hospital the Americans set up along miles of river. The jungle canopy provided roof over straw mattresses line up on the ground. President Roosevelt promised rescue, but this was wartime and reinforcements didn’t come for years. Nurses toted river water to bathe patients, open latrines attracted flies and rats. Rations and ammo ran low. Doctors and nurses convulsed with malaria chills on the job, but they kept going. Rations were quartered. The nurses received one meal every two days supplemented by snake eggs and monkeys taken from the jungle. The Japanese bombed the makeshift hospital, calling it an accident. Nurses evacuated first to Corregidor Island, then to an underground hospital, serving 1500 patients in a makeshift facility designed for 500. When the Japanese advanced again, Americans surrendered May 6, 1941. Now prisoners of war at Santo Tomas, they continue to nurse patients—both allies and Japanese. The women wondered. Would they be raped? The Japanese had “raped” Nanking. They planted small gardens to supplement their miniscule rations. When they had the energy they wrote and presented plays, played musical instruments. And felt guilty. Every day more people died. By the time of liberation, February 3, 1945, each surviving nurse weighed in at about 80 pounds. Why is this story so fascinating? Because they’re heroes? Yes, but also you wonder how you would endure it. How would you behave? Or would you even survive? The book touches on the fact that this was a generation of under-appreciated women. Once home in America the nurses were denied disability imbursement despite serious prison-induced ailments. They were not lauded or decorated until they were old women. On that front things are improving but we still have a long way to go. Patricia Hruby Powell is a nationally touring speaker, dancer, author. Her new work Josephine: The Dazzling Life of Josephine Baker is available at bookstores. Lost myself in this. Made me cry. “Denied disability” made me cry, then made me angry. I feel as though not much has changed for many, even in this country. Thank you for reviewing my book PURE GRIT! I appreciate you passing the word about these amazing American heroines. I have heard about THE DAZZLING LIFE OF JOSEPHINE BAKER, but haven’t had a chance to read it yet. What an incredible book, Mary. Thanks for writing. I loved it. I’m taking off right now to accept a Boston Globe Horn Book Honor for Josephine. It’s pretty exciting. I want people to know Josephine. Everyone in France seems to know her, not so much here.